The Jackson Laboratory (JAX) said it will expand into China through a strategic collaborative clinical genomics research agreement with three groups in Wenzhou. JAX will collaborate with the Wenzhou Municipal People's Government, Ouhai District People's Government (WZ), and Wenzhou Medical University and its affiliated hospitals (WMU), to conduct research on the genomic causes of disease. WZ and WMU will form the Wenzhou Institute for Genomic Medicine (WIGM), which will conduct research under JAX’s scientific direction and management. The WIGM will employ 200 faculty and staff in 15 anticipated research groups, JAX said. The collaboration, JAX said, will allow it to access the clinical experience and expertise of the medical university and its affiliated hospitals, while WMU gains access to JAX's research and scientific expertise. “Working together in our shared quest to improve human health, we will better understand the roles genes play in disease and significantly accelerate the development of treatments and cures for people around the world,” JAX COO and evp Charles Hewett said in a statement. Hewett joined JAX President and CEO Edison Liu, M.D., Mayor Zhang Geng of Wenzhou, Mayor Wang Zhenyong of the District of Ouhai, and Lu Fan, Ph.D., president of WMU, at a signing ceremony June 4 at The Jackson Laboratory for Genomic Medicine in Farmington, CT.
JAX has agreed to initiate medical genomics research collaborations among WMU and JAX faculty both in the U.S. and China. 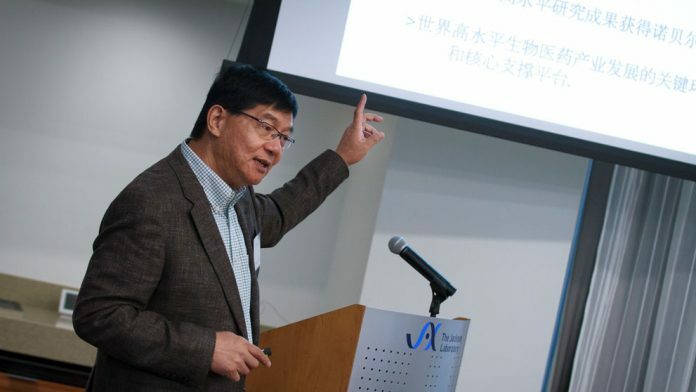 Collaborative work regarding the structure of DNA by Professor Yijun Ruan, Ph.D., the development of cardiomyopathies by J. Travis Hinson, M.D., and pediatric brain tumors by Ching Lau, M.D., Ph.D., has already begun, JAX said. The JAX-Wenzhou collaboration will take place in two phases. In the first, a clinical research presence will be established on the campus of WMU and in the Life & Health Town of Ouhai District, Wenzhou, where approximately 50 to 70 new staff in six research groups will conduct research and clinical genomics. In the second phase, a standalone state of the art facility will be built in Life and Health Town in the Ouhai District near WMU Affiliated Hospital #1, and will house both clinical genomics and mouse-based functional research laboratories. The 200,000-square-foot facility will be built as part of a new Health Industry Innovation Center, an R&D incubator for the biomedical industry.